In these days newspapers and online communities started to take into consideration early Qur’anic manuscripts. This is thanks to Dr. Alba Fedeli, who discovered one of the earliest known copies of the Qur’an. Being a former student of Professor Alba Fedeli, and having written my bachelor thesis on the Sanaa manuscripts, under her supervision I was of course iper-excited by such a great news: happy for her, for her research and for her achievement. Being Dr Fedeli Italian, of course the news spread on Italian media. Some of my friends and relatives texted me to make sure that the news also reached me, in the Netherlands. What surprised me was the content of the text-message of one of my dearest friend, which being a psychologist does not really know a lot about manuscripts and carbon dating. Anyway she wrote me something like: “Ehy you, I’ve just heard on the TG5 [Italian TV news] that an Italian researcher has just discovered a manuscript of the Qur’an that was written before Muhammad started to preach!”. My reply: “Before what?”. That was disinformation. I watched and watched the video by TG5, and I found it difficult to understand, not explanatory and deceptive, in a way. Then I started to swear against the TV news, I told her not to watch TV news at all and I started to speak about C14, dead sheep, calligraphic styles and then I started again swearing against Italian news. A discussion on carbon dating and manuscripts cannot overlook the importance of dead sheep. The manuscript are usually written on parchment which are made from processed animal skin. It is the material which is carbon dated, not the writing. The fact that it is the material that is dated has some consequences. The best example to understand this is that a crucifix can be carbon dated to 2000 before Christ: how can it be? Quite easily: the tree from which the crucifix was carved had been cut down two thousand years before the birth of Jesus Christ. In this case, carbon dating is quite useless to determine the manufacture of the crucifix itself, which has still to be inferred from the style and technique displayed. This example is borderline, but it is quite explanatory: C14 can help, of course, in dating the material, but still it cannot give us a clearer perspective on the manuscript if it’s not used together with other dating methods. And now the dead sheep. Sheeps were quite expensive. If we figure ourselves in the Middle East, in the Arabian Peninsula, around 600 c.e., in a semi-nomadic society that lived of pastoralism, we can figure out that a sheep was quite an important thing. Parchment was nothing cheap at the time. And this is even clearer when we take for instance the Qur’anic manuscripts of Sanaa, for someone ever older than the Mingana ones. Some of them are palimpstest, which means their next is overwritten on an extant text, the parchment having being washed out. 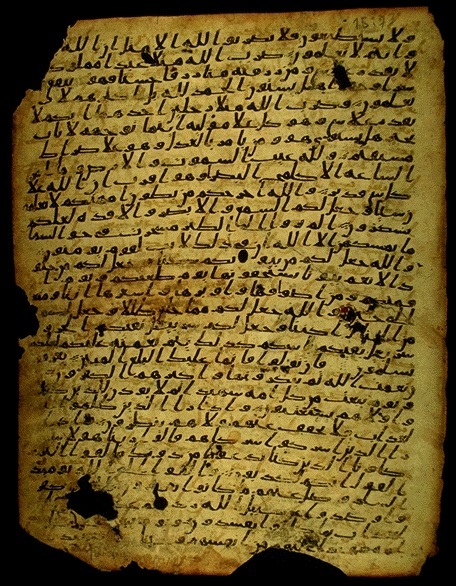 Palimpsest in hijazi style, Sanaa manuscript corpus, 1-27.1, courtesy of Unesco. Sergio Noja Noseda, late mentor of Dr Fedeli herself, when writing about these palimpsests, made this point very clear: the parchment was too valuable, and re-using it was the best solution instead of purchasing a new one. I will not delve in the Sanaa manuscript and palimpstests, but actually they are quite explanatory: the sheep were valuable, the parchments were expensive. They were expensive, thus it is quite unlikely that the parchment was not used for many years after its manufacture: you produce it, it’s expensive, thus you use it quickly to avoid a long-lasting storage that can eventually ruin the material. This is common sense. Still we are not 100% sure on the date of the writing, calligraphy and codicology being probably the only answers. The hijazi script is the most common in really early Qur’anic manuscripts and most interestingly, it was used only for a couple of centuries, before being replaced by the well-known kufic script. This of course agrees with the carbon dating. The Birmingham Qur’an is not the only one to have been carbon dated. 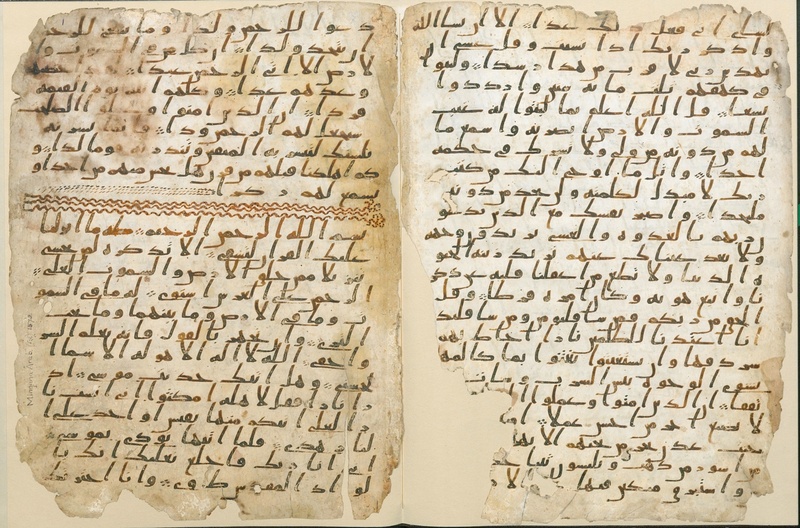 Roughly one year ago the Univeristy of Leiden published the results of a carbon dated Qur’anic manuscript: in this case the C14 gave another interesting result. That parchment has been dated between 650 and 715. Early, but well into the Islamic period: the Prophet Muhammad died in 632. The Birmingham Qur’an is, on the other hand, trickier: being dated between 568 and 645 the parchment may well have been produced even before the birth of the Prophet (570 ca.). If we consider the value of the parchment, it is likely that the text was written more or less in the same time-span, a time-span which include anyway a period in which the revelation had already taken place. The real interesting part is the content, at least for me. Because many words have been said about the dating, but the Qur’an is the text, and early manuscripts help us understanding the origin of the text. From a really quick comparison between the text of this manuscript (right hand page, containing the first parts of Q 20 – Surah Taha) and the nowadays text, it is clear that there are but minor differences, likely due to the linguistic competences of the scribe(s), and this is also what merges in Dr Fedeli contribute to the blog of the International Qur’anic Study Association. Much more can be said, about the hijazi script and its historical use in Qur’anic manuscripts, about the content and deviations from the standard texts, about the social context that could have originated this manuscript…but probably it is to early now, and first we should read the PhD thesis by Dr Fedeli to have closer look on the matter (when it will be available). Sergio Noja Noseda, “La mia visita a Sanaa e il Corano palinsesto”, in Rendiconti. Istituto Lombardo, Accademia di Scienze e Lettere, CXXXVII,1 (2004), pp. 43-60. Totally nonsense claim to anyone with basic knowledge on C-14 dating. BTW, is your bachelor thesis on Sana’a manuscripts available to read? Thank you for your comment Ahmed! Unfortunately my Bachelor thesis is available only in Italian. If you want I can share it with you anyway! Should you be interested in something specific let me know and I will be more than happy to translate/share parts of it. Sure, but can you please share your thesis’s abstract to get a clue?